Transfer and tours as per the itinerary. Refreshment ( Fruits, Mineral water). Return Airfare ticket from/to Dps/JKT. Any personal expenses, such as: laundry services, phone call, tipping, soft and alcohol drink. Arrival at Wai Oti Airport Maumere, meeting with our guide and Driving-up to Moni for 4 hours with several stops at Ledalero - a major Catholic Seminary - to visit the museum with its various collection of local royal families' old portraits, antique hand woven clothes, stagedeon fossils, etc. Proceed to Paga beach for having lunch at local restaurant. 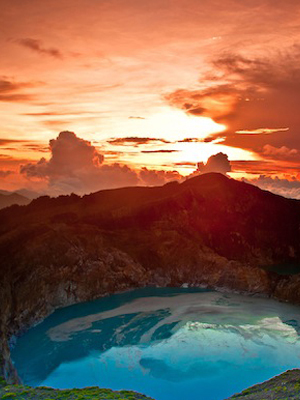 Accommodation and dinner at KELIMUTU ECOLODGE or FLORES SARE HOTEL. 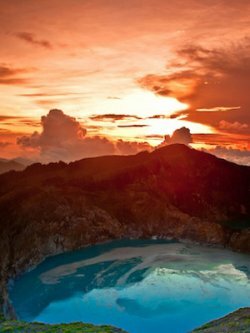 It’s worth to experience the sun rise a Proceed to Moni for overnight and Dinner at FLORES SARE HOTEL t Kelimutu three colored crater lakes You will begin your day early in the morning ( start abt 0.4.00 o’clock).Once you arrive in Kelimutu volcano you will find yourself something like nowhere – incomparable with known told stories – photos or even moving pictures you have seen before. After admiring the nature wonder drive to Maumere.On the way you will experience the dramatic change in both nature pattern and ethnicity. You could be found yourself in the Lio ethnic’s environment – pay at call to their villages WOLOGAI ORG KOANARA VILLAGE and try to comprehend the locals daily life or just having closer look into their work of architectures. Lunch could be served in Paga beach Restaurant or in Maumere town. Dinner and Accommodation in SEA WORLD CLUB or WAELITI HOTEL Maumere. Breakfast at the hotel. After breakfast, we leave your morning at your leisure until the transfer to the airport to catch flight to Bali.